married at Cranwell, Alana chose SEVEN salon.spa for hair & makeup services. Wedding hair is art that must stand the test of time (to give photos albums a timeless look). Perhaps just as challenging, though, is the matter of keeping the hairdo in place for twelve hours through the wedding ceremony, reception, dinner, and dancing. Mark Johnson, owner of SEVEN salon.spa in Stockbridge, Massachusetts, jokes, "Everybody is hugging the bride and you're thinking, 'Oh God, don't touch her hair!'" 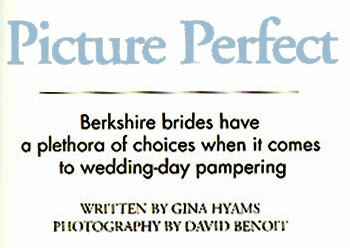 Outdoor summer weddings are popu¬lar in the Berkshires, and humidity, not to mention rain, can wreak havoc on a bride's locks. Weaver describes the process of creating a bridal hairdo as being like building a house. "You can't slap it together and expect it to last," she says. "I build the hairdo piece by piece, teasing the hair and making ten times the normal amount of curls because each element can't be too heavy or gravity will pull it our." Hairstylist Dani Nisbet of InTouch Massage and Day Spa in Williamstown, Massachusetts, sums it up this way: "Hairspray is vital." New York City doctors Alana Belfield Levine and Steven Michael Levine were married last fall at Cranwell, in a large ceremony that included five btidesmaids and eight groomsmen. The theme of their wedding was "Berkshire Garden," with lots of lush fuchsia-pink roses, orange spray roses, orange gerbera dai¬sies, green hypericum berries, and green hydtangeas. The bride's Cristina Arzuaga strapless lace wedding gown glittered with Swarovski crystal beading. Levine set up a trial run with Johnson at Space Salon in Soho, where he tends to his city clients two days a week. She remembers, "Mark cut my hair and then we experimented with styles. I really wanted an up-do with an old Hollywood feel. We talked about all the services I wanted, and he was absolutely wonderful about setting everything up for us. The day of the rehearsal dinner, I went to the salon in Stockbridge for an amazing massage. Then two of my girlfriends joined me and we all had manicures and pedicures. Maurice [Peterson, co-owner of SEVEN salon.spa] ordered us lunch and served it to us right in the salon as we had our toes done. It was so fun! Then Mark did my hair for the rehearsal dinner. I wore it down in long waves." The morning of the wedding, Johnson came to Levine's suite at Cranwell, where she had invired her bridal party, mother, mother-in-law, and sister-in-law to have a pre-wedding brunch of fruit, granola, yogurt, coffee, juice, and mimosas. "Mark and one of the girls who works at SEVEN did everyone's hair--everyone wanted something a little different," recalls Levine, "so one girl had a very classic up-do and a few others had half-up/half-down or down in waves. They were all so happy with how they looked. I had my hair done in an up-do, like I mentioned, and finished it with a pearl and crystal headpiece from Winters & Rain." Johnson also styled New York Ciry-based journalist Alexis Mainland's wedding at Wheatleigh last year. For makeup, she hired his colleague, Hiroko, from Space Salon. Since Hiroko doesn't drive, Mainland hired a car to take her from New York to Lenox and back in one day. "It was a bit over the top, but worth it," she says in retrospect. Mainland explains, "I felt very strongly that I did not want to look like a queen, princess, or foreign dignitary with stiff hair and lacquered makeup. I think in the end I looked natural and relaxed, though completely polished. It's amazing how much effort it takes to pull off a look like that. I think it's harder than the other kind of look." In the wee hours of the morning after the wedding, the newly married couple and their friends enjoyed a late-night after-party in Wheatleigh's heated ourdoor swimming pool. As testament to her bridal makeup's durability, she notes, "Even after jumping in the pool, my makeup still looked fabulous!"